There's been lots of coverage of Matt Stajan's eye injury, which apparently happened when he was hit in the face with a soccer ball during a warmup session. What's missing from the stories I've seen so far is a culprit. Last time I checked, soccer balls don't just fire themselves down a hallway. So the question becomes, who did it? Who took out the Leafs' leading scorer? I'm not sure I can answer that, but I do think that we can narrow the field by the process of elimination. Here's a list of Leaf-related suspects I think we can declare innocent of all charges. Jason Blake - Shot would have fluttered harmlessly into Stajan's chest. Ryan Hollweg - Would have been the first known instance of him hitting somebody who was facing him. Vesa Toskala / Curtis Joseph - So far this season, have not been involved in any cases of a shot actually being stopped. 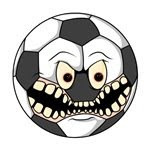 Howard Berger - Could not possibly spend time playing silly games like soccer when there are sick children dying in the hospital. Luke Schenn - Would have immediately laid hands on Stajan, healed him. Brian Burke - Wait, did you say "soccer"? What are you, some kind of European? You're traded! Tomas Kaberle - Not sure what you mean by "shooting". Is that like a really hard pass or something? John Tavares - Is not actually on the Leafs roster. That's a recurring dream you've been having every night since the WJC started. Ian White - Spends 100% of off-ice time grooming moustache. Damien Cox - Couldn't have been involved, since that would have meant actually being near the dressing room. Lee Stempniak - Upon trade to Leafs, signed contract addendum agreeing to never do anything that has any impact, on anything, ever. Mats Sundin - No longer plays for Leafs. You were probably unaware of this due to the lack of media coverage. Dominic Moore - Former Harvard grad has no interest in soccer, and has so far been unsuccesful in organizing impromptu hallway games of fencing or lightweight crew. Jeff Finger - Too busy with regular off-ice activities: rolling in pile of money, looking at statistics, laughing hysterically. Alexei Ponikarovsky - But did immediately hammer the rebound back into Stajan's face out of force of habit. Ron Wilson - Is a wise judge of talent who instantly recognized Stajan's abilities, and would obviously never do anything to remove him from the lineup. No Leaf-related content here, but just a quick note on a subject that comes up fairly often in NHL circles. A lot of fans seem to misunderstand an important part of the NHL's video review process. Last night, Sidney Crosby scored a controversial overtime goal against the Sabres. His stick appeared to make contact with the puck very close to the crossbar level -- it was hard to tell, even in super slo-mo. 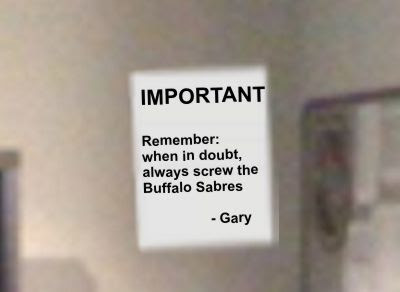 As per league policy, the call went against the Sabres. As always happens when a replay is inconclusive, many fans have assumed that the call made by the on-ice officials stands. In this case, a goal. Let's clear this up once and for all: That's an NFL rule. There is no such "inconclusive" rule in the NHL. The NHL rulebook (pdf link) makes no reference to the call on the ice being the tie-breaker on an inconclusive replay. In fact, it makes no mention of inconclusive replays at all. My reading of the rules is that the NHL doesn't accept the concept of an inconclusive review. Put another way, the video goal judge has to make a call one way or the other. In some cases (a puck crossing the goal line), an inconclusive replay would mean the call was no goal. But the replay official can't get off the hook by passing the buck back to the on-ice crew. Once he's involved, the on-ice call becomes meaningless. Have I got this wrong? This misconception comes up so often (even from broadcasters) that I'm wondering if the league has ever addressed it. I can't find any reference to the inconclusive calls in the league's rulebook or anywhere else, but if the NHL has ever clarified this and somebody has a link, please post it in the comments. Howard Berger has reported, and Damien Cox seems to have confirmed, that Brian Burke has told the agents for Tomas Kaberle and Pavel Kubina that they won't be asked to waive their NTCs at the deadline. This is madness. The Leafs desperately need to make moves with an eye to the future, and Kubina and Kaberle are two veterans who should be on the trade block. That doesn't mean Burke has to trade either guy, but both should be available for the right price. Has Burke, who once called NTCs "coach killers" and promised not to give them out, suddenly gone soft on us? Is he really more concerned with protecting Kaberle and Kubina's feelings than with doing his job? Is this some sort of reverse psychology ploy, where Burke plays good cop and let's the harsh reality of the standings do the rest? Or could he have a Plan B? As we near the mid-way mark of the season, the Leafs look like a bad team -- outclassed most nights, certainly no threat to make the playoffs. But they're not among the worst of the worst, and as such are seeing their hopes at a top draft pick fade. In a draft with two franchise players, the Leafs look more like a team that will wind up holding a pick in the #5 - 8 range. That means Burke can wave goodbye to John Tavares of Victor Hedman. Unless, of course, he trades up. And since he doesn't have many picks to work with, wouldn't it help if he had a star player in his prime to dangle in any draft day trade talks? This is all speculation, and obviously we're months away from seeing how all this plays out. Would a team like the Islanders, Thrashers or Lightning that feels some pressure to improve now be willing to move out of the #1 spot in exchange for Kaberle and, say, the #5? Put another way, could Burke swap Kaberle at the draft for enough picks to move up? Not necessarily. It would almost certainly take more on the Leafs side of the equation to make a deal work. But without having a card like Kaberle in his deck, Burke has have virtually no shot at a top two pick unless the Leafs go into a freefall. Keep in mind, Tomas Kaberle's no-trade clause expires after this season, opening up a window where he can be dealt anywhere. If he's still a Leaf at the end of the season, and assuming Toronto misses the playoffs yet again, Burke can move him anywhere he wants. So if you're Burke, do you move Kaberle at the deadline -- to a team of his choosing, with limited opportunity for a bidding war, and with all the NTC-related begging and pleading that seems to entail? Or do you hold onto him, get some bonus points for honoring your NTCs... and then have the option of blindsiding him at the draft table? Surely Brian Burke has more on his mind than being a nice guy. Anyways, here's a few quick thoughts and links on the Sundin fallout. I'm going to resist the urge to get upset over the Star's Sundin interview in which he describes leaving Toronto with a "bitter taste". Sundin comes across as a thin-skinned prick in this article, but I'll give him the benefit of the doubt because I suspect Rosie DiManno had already decided to write this kind of article before the interview even started. I'll wait to hear from Mats via somebody without an axe to grind, thanks. In a similar vein, there are reports going around that Mats chased the money this time because he never got over taking a "discount" to sign with Toronto in his final year. Al Strachan has also reported on HNIC that Sundin was deeply upset that the Leafs even considered trading him despite his NTC. Again, I'll give him the benefit of the doubt, considering the sources here. But if this sort of stuff turns out to be true... well, go screw yourself, princess. With a glove tap to fellow Score Network sellout partner Lions in Winter, here's an interesting chart that shows the NHL players with the highest career earnings of all time. I'll just post the link without comment. Remember, though, Mats didn't owe the Leafs anything. Canucks Hockey Blog, another Score Network site (if there anyone left who isn't in this thing?) weighs in with the Vancouver reaction. As you can imagine, they're pretty excited. Here's the flip side: A Canucks blog that didn't want any part of Mats. Finally, the Mats signing has kicked off a predictable round of hand-wringing over how Leaf captains never seen to retire with the team. But how many NHL teams actually do have their captains retire while wearing the "C"? Cox and friends never seem to mention that part. Well, Bitter Leaf Fan actually has the answer. Not counting careers cut short by injuries, how often do you think it happens? To find out, check the end of this post. I'll have full thoughts on the Sundin signing later. But I wanted to get a quick post out of the way, because we all know what's coming tomorrow. Every sports section, hockey show and sports blog will be covering the Sundin signing. And you can bet that most will feign confusion over why Leaf some fans have turned on him. They'll shake their heads sadly and say "don't those silly Leaf fans realize what a great player he was?" First things first. Not all Leaf fans are mad at Sundin. Plenty of us have supported him all along, and many others gave up caring long ago. Despite what Howard Berger tells you, not all Leaf fans think as one. But yes, a lot of us are still holding a grudge, and some of you can't figure out why. So I thought I'd try to clear it up. Here's why Leaf fans are mad. Mats Sundin spent 14 years in Toronto. During that time, he was the third highest paid player in the entire NHL behind only Jagr and Sakic. We can save the argument about whether he was worth the money for another time (spoiler alert: he wasn't). But there's no disputing that the Leafs treated him well. In the past few months we've often heard about how Mats wasn't worried about money. I'd hope not. He had plenty of ours. At the end of those 14 years, with the John Ferguson era roster a complete mess, the Leafs desperately needed to rebuild. They worked on various trades to send Mats to a Cup contender. He had a no-trade clause, and they asked him to waive it. Depending on who you listen to, they may have begged him to waive it. Yes, he had every right to say no. Everyone acknowledges that his contract gave him that power. Not one single fan has ever argued that Sundin didn't have the right to do what he did. This is about more than a contract. After 14 years, lots of people felt that Sundin didn't owe the Leafs anything. And apparently, Mats was one of them. The deadline was a bad day for Leaf fans. 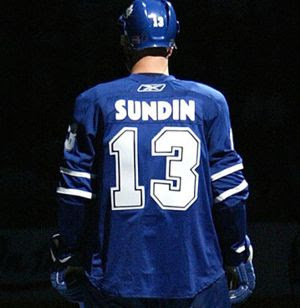 But if Sundin had stayed, he'd have been forgiven. If he'd re-signed, he'd be a hero. If he'd retired, he would have understood. But he didn't. He told us he never wanted to play anywhere else. He fed us a story about "the full journey". Then, almost immediately, he started eyeing the door. His "no rental" reasoning was ridiculous at the time, a transparent creation of some PR flack. Despite his assurances about wanting to finish his career in Toronto, whispers quickly went around that Mats was sulking, upset at the idea that the Leafs would even think about dealing him. At the end of the year, when it was time for his annual disappearing act back to Sweden, it already felt like we'd seen the last of him. Once it was clear that he wasn't coming back (and it's been obvious for months now), the damage was done. Everything that came after -- his embarassing indecisiveness, his refusal to address the media, his eventual re-emergence to shill for a gambling web site, and even his flip-flopping over the past few weeks -- didn't really matter to us. He's probably damaged his reputation with fans around the rest of the NHL, but Toronto fans are just glad it's over. Will we forgive him eventually? Yes, of course, almost all of us will. Mats Sundin spent 14 great years in Toronto. He was a great player, a strong leader, and a class act. The fact that he spent his final months as a Maple Leaf acting like just another spoiled diva athlete will tarnish that legacy, but not destroy it. But here's the bottom line: Mats Sundin torpedoed the Leafs best chance at a return to respectability because he swore he wanted to stay, and then it turned out he didn't. And after 14 years, he couldn't even be bothered to look us in the eye and tell us the truth, back then or in the months since. Maybe he'll get around to it eventually. But let's just say some of us aren't holding our breath. With a glove tap to Bitter Leaf Fan, here's a fascinating look inside the NHL's "war room" in Toronto. 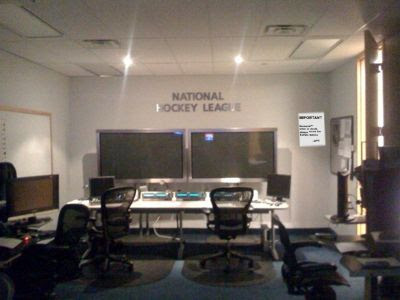 This is, of course, the infamous room where every goal scored in an NHL game is reviewed by league officials. This is the place where goals, games, even seasons are decided based on the judgement of the league's best and brightest. Now, that's pretty cool. But does anybody see anything odd? What's the deal with that big notice posted over in one corner? It looks important, but I couldn't make out what it said. 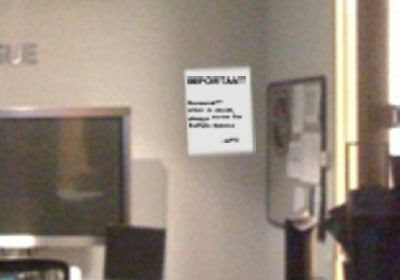 OK, call me crazy, but doesn't it look like that notice says "IMPORTANT" on it in big letters at the top? What could possibly be so important that the league would want their off-ice officials to be viewing it at all times? Christmas is just a week away, and you know what that means: Mats Sundin has almost finished picking out a Valentine's gift for his wife. But for the rest of us, it's time to get shopping. Luckily, Leaf fans are easy to buy for. After all, pretty much every product imaginable has had a Maple Leaf slapped on it at some point. But why not go the extra mile for that special Leaf fan in your life? Why not get them a rare collectible that they'll cherish forever? To help get you thinking creatively, here's my personal list of my Most Wanted Maple Leaf memorabilia. These are the gifts I'm hoping to find under my tree this year. An authentic Al Iafrate helmet - Just so I can have something to wear at all times once I eventually start going bald. I'd also be interested in other Iafrate collectibles, such as the stick he used to set the slapshot record, a game-used pack of cigarettes, and one of Gary Leeman's old condom wrappers. The paperwork from the agreed-on but never consummated Vincent Lecavlier trade - Apparently the Leafs were ready to fax in the paperwork when the Lightning ownership called the deal off. What happened to it? They couldn't have just thrown it out. Somebody must have it in a file folder somewhere in an office at MLSE. I think I would have it framed in an impressive glass case, which I would smash my head through every morning on my way out the door. A game-worn Jason Blake jersey - It's just like all the other game-worn jerseys, except without the sweat stains. Andrew Raycroft's glove - I'd nail it to my garage door, and drive my car through it every day. Marty McSorley's eyeball from Game One of the Kings series - Somebody must have it, since it flew into the stands at the Gardens about three seconds into this fight. If you worked at MLG as an usher and once found a human eyeball with a knuckle-sized divot in it, call me. Speaking of Wendel memorabilia, I would also accept Curtis Joseph's disintegrated mask, Cam Neely's dignity, or the corpse of Bruce Bell. wait, did I do that one already? 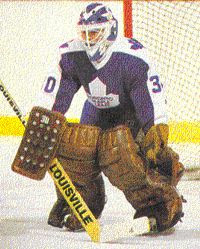 Allan Bester game-worn goalie pads - My infant daughter would look adorable in them. An officially licensed Mats Sundin weathervane - I could set it up outside and watch it flip back and forth whenever the wind changed. It would also be fun to watch all the journalists crowd around it to breathlessly report on its every move even though it never actually went anywhere. A vial of water from Luke Schenn's water bottle - Just in case anyone I know is ever diagnosed with leprosy. A John Kordic #27 jersey - Then I would go to an autograph show and ask Frank Mahovlich or Darryl Sittler to sign it, just to see how they reacted. The pen that JFJ used to sign contracts with - I think it would be fun to have around, just for those moments when somebody needed to sign something that was going to turn out to be a terrible mistake. Damien Cox's laptop keyboard - It's in pretty good shape, it's just that the 1, 9, 6 and 7 keys are worn out. The water bottle that Brian Papineau went crazy with after the Borschevsky goal - I don't even have a joke here. I'd pay hundreds of dollars for this. Then I'd fill it up with water, carry it with me at all-times, and then spray it all over every time something even remotely positive happened in my life. Winning pro-line tickets, moderately positive work reviews, daughter makes it through bath time without pooping in the tub... water bottle spray! A Leafs series-winning goal puck from a Toronto/Ottawa series - Wait, scratch that. Collectibles are only valuable if they're rare. The stick that Wayne Gretzky high-sticked Doug Gilmour with - I would easily pay $1,000 for this. I mean, I wouldn't even hesitate at that price -- that money would be out of my daughter's RESP and into the hands of some shady e-bay collector within seconds. And I think I'd be willing to go much higher (remember, I'm the guy who once paid $50 just to deface Gretzky's hockey-reference.com page). The big question would be, what to do with it? Do you display something like that in your basement? Destroy it in some sort of ceremony? Set it on fire to see if the choking black smoke formed into a giant Habs logo? I think the first thing I'd do would be to get the stick autographed by Wayne Gretzky, then immediately write a confession directly above the signature. And by the way, if you think I wouldn't have that stick in a CSI lab for conclusive blood samples within hours, you don't know me well enough. I think I might end up taking it to Kerry Fraser's house and using it smash out the windshields of his car, just so I could see him peer out of his window with a confused look on his face, unable to determine what was happening before looking around for some linesmen to throw under the bus. What about you guys? What's on your most-wanted list? When we said we wanted our Saturday nights to have a "playoff atmosphere", this isn't what we meant and you know it. Mats Sundin is in the news again. Kind of. A Chicago Tribune reporter has weighed in on Sundin. And unlike most sports reporters, he's not interested in blowing smoke about Mats being "classy" and "respected" just because he never turned down interview requests. Instead, Steve Rosenbloom does a rip job on Sundin, questioning his "heart" and his "spine" and sniping that he's "never been on a champion". Ugh. Putting aside the glaring fact that the Swedish Olympic team would disagree with that last bit, I long for the day when we can stop using "championships won" as the sole indicator of player success. I've been as harsh on Sundin as anybody, but even I'm not going to argue that a lack of a ring somehow makes Sundin less of a leader than George Parros. So yes, I think Leaf fans have every right to be mad at Mats Sundin. But that said, the guy can still play and any GM of a contending team would be crazy not to make him an offer. But here's the catch, and it's one most of the media covering the story are missing: Why would any NHL GM want to make Mats Sundin a multi-year offer? It's taken Sundin seven months (and counting) to decide whether he wants to play this year. Why would you want to make a commitment to him for next year too? 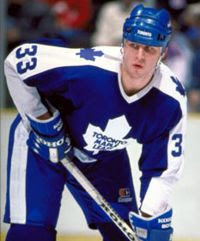 And before you accuse me of more anti-Sundin nitpicking, remember this: Sundin is over 35 years old. According to the CBA, that means that if he signs a multi-year deal and then retires during it, his new team is still on the hook for his entire cap figure. They don't have to pay him, but they still take the cap hit. Every dollar of it. Yes, if the Canucks land Mats with their infamous 2-year, $20-million offer and he decides to hang them up next summer, the Canucks take a $10M cap hit in 2009-10. And yet we're suddenly hearing about teams offering Sundin multiple years. That's madness. It's one thing to take a very reasonable gamble on Sundin for one year. It's another to risk your salary cap for the future to make it happen. I know, I know. 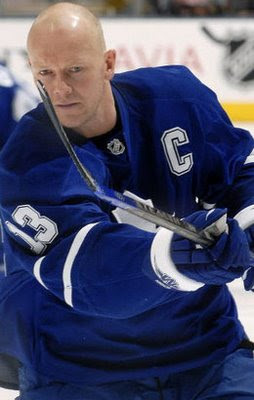 If Sundin signs a multi-year deal, it will be because he wants to play for more than one year. He'll only put pen to paper on a long-term deal if he has every intention of honoring it. But we all know that Mats likes to change his mind. And six months is a long time in Mats Sundin's world. Would you want your favorite team to risk it? We're officially two months and one-third of the way into the 2008-09 season. Those two milestones, combined with my inability to think of anything interesting to write about this week, seem like an excellent opportunity to look back on some pre-season predictions. So let's travel back to my 10 Random Leafs predictions, as posted on Pension Plan Puppets. These were posted on October 8, one day before the Leafs opened their regular season. Do I actually know what I'm talking about when looking ahead to the future instead of back to 1993? Let's see how I did. For the first time since Kevin Maguire in 1991, the Leafs' only enforcer will be a designated punching bag who'll be ready and willing but not especially able. 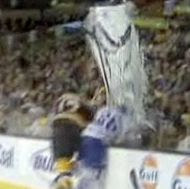 It won't take long for Leaf fans to get tired of his nightly Kimbo Slice impression. The verdict (so far): This one was almost too easy. Hollweg already had six losing fights and one suspension under his belt from the pre-season, so predicting that he'd be useless wasn't difficult. And while he's managed to keep his nose unfractured clean lately, that won't be enough to win over Leaf Nation. So yes, I got this one right... but so did everyone else who was paying attention. Also, I'm deeply disappointed that "Kimbo Hollweg" never caught on. The anti-Finger backlash is probably the most predictable element of the new season. But the flip side is that it won't take long for folks to realize that while he's not worth $3.5M, he's also not terrible. And that will lead to an emerging storyline of "Jeff Finger, so over-rated he's under-rated!" The verdict (so far): OK, so I said November and it's happening in December instead. Factor in the time Finger has missed due to injury, and we're right on schedule. That said, the Finger fan backlash was never really as bad as I expected. Maybe missing the first few games will turn out to be a blessing. The same media that dogged them and worked to drive them out of town will breathlessly report on every goal these guys score all year long. The verdict (so far): Tucker and McCabe haven't done much. Wellwood was hot early and we was saw the predictable "Leafs let one get away" stories, especially around the time of the Canucks game. But even those died down once Fatty McCrunchandmunch cooled off slightly. Admit it, you hadn't thought of it but you're already nodding your head, aren't you? The verdict (so far): Too soon to tell, of course, but this one is looking good. With the Panthers struggling to stay at .500 and rumors of an imminent Bowmeester trade, the Panthers should be selling at the deadline. And now that McCabe BFF (and main reason for agreeing to go to Florida in the first place) Wade Belak has been dispatched, McCabe will likely agree to move. Damien Cox will find a way to turn that into a knock against Cliff Fletcher, by the way. Yes, he's coming back. And when he finally gets around to cherry-picking a front-runner to join some time after Christmas, the hockey world will circle the date of his return to Toronto as a visitor. The verdict (so far): It looks like I may be off by two weeks on the timing, but Mats is apparently ready to cherry-pick away. I stand by my prediction that the ACC crowd won't know what to do when he returns as a visitor. And no, I don't know which two. But the truth is, if two guys from the list above can elevate their games to breakout status then that's pretty good. The verdict (so far): Of the guys listed, only Kulemin has been a pleasant surprise. Steen is gone, Tlusty was a bust, Stralman has been iffy and Frogren was just OK when healthy. On the other hand, I somehow managed to leave Grabovski off my list of promising young players. If I hadn't had that brain cramp, I'd be looking good on this one. The verdict (so far): He was hurt, and benched, and then traded, so I can shrug this prediction off as not being technically proven wrong. I know, I know. I've been as hard on Blake as anyone. But this year, Blake looks sharp. Here's betting that he puts together a decent year -- let's say 25 goals. The verdict (so far): My god, I am a stupid, stupid man. Why does anyone even read this blog? More importantly, with so few functioning brain cells, how do I manage to feed myself? The verdict (so far): Sadly, this one looks good. A standout season by Toskala was the one and only way the Leafs could make a playoff run this year, and he hasn't come close to delivering. Two months ago, you rarely heard Toskala mentioned as trade bait. Now, everyone assumes he's as good as gone... if the Leafs can find a taker. It will also result in approximately 100 posts on Down Goes Brown in the weeks leading up to the big night. The verdict (so far): Wow, I nailed that one. The bottom line: I nailed a few easy ones, was reasonably accurate on few of the reaches, and still expect to be proven right on the McCabe trade prediction which I didn't see anyone else make. On the other hand, Colaiacovo let me down and the Blake prediction was just awful. Overall, I give myself a B-. I spent most of Friday finishing continuing starting my Christmas shopping. While wandering through a book store, I found what may end up being the coolest gift of the holiday season. Yes, there is now a full-length children's book about how awesome Wendel Clark is. Wendel and the Great One by Mike Leonetti is the touching story of David, a young boy who is named captain of his youth hockey team. His proud father sets out to teach him about the value of leadership through the examples of two NHL captains, Wendel Clark of the Toronto Maple Leafs, and also some skinny guy from Los Angeles. 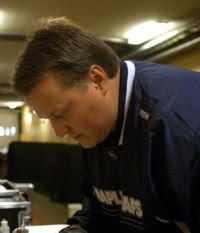 The book takes place during the 1993 season and playoffs, culminating with the Leafs and Kings meeting in the conference finals. Along the way, David learns how to be a leader on and off the ice by watching Wendel every night. I haven't read all the way through, but I'm asuming the book ends with young David cornering the school bully and punching out all his blood. The book, in large hardcover format, includes plenty of colorful full-page illustrations by Greg Banning. Many feature Clark and Gretzky, as well as Doug Gilmour who also plays a prominent role in the story. Let's get this out of the way now: Unfortauntely, the book doesn't have the courage to deal with Gretzky's infamous high-stick. This results in a wasted opportunity to teach children the important lesson that sometimes, terrible things happen because bad men are stupid, cowardly and dishonest. Yes, some would argue that bringing up the Fraser incident would be too traumatic for younger children, causing them to break into tears, suffer from night terrors, and ultimately question anything that their parents may have tried to teach them about the existence of a just and loving god. On the other hand, any child being brought up as a Leaf fan might as well just learn how to miserable now. But while Wendel and The Great One ducks the high-stick, the book does include a passage about the Clark-McSorley fight. Historians may end up regarding this as the coolest paragraph in children's literature history. 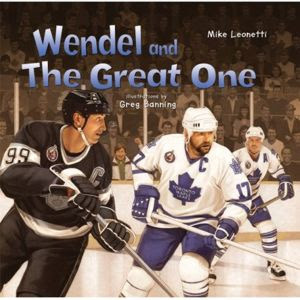 Wendel and The Great One is available from Amazon, Chapters, and your local book store. Make sure there's a copy under the tree of the young hockey fan on your Christmas list. Lots of panic in the Barilkosphere today over Tomas Kaberle's recent Bryan McCabe impression. The concern is that, much like Vesa Toskala, Kaberle is having a bad year right when the Leafs need to trade him most, killing his value in the process. Kaberle and Toskala are in very different situations. Toskala's shaky play could drive his value down significantly. Kaberle's won't. Here's the key different. 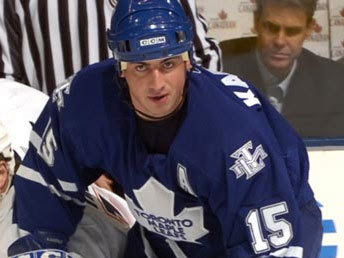 Tomas Kaberle has a track record of years of excellence in the NHL. He's been playing at a high level for virtually all of a long career. One bad half-season won't drive his value into the floor. Sure, his value may not be as sky-high as it was last year when his refusal to waive his NTC cost the Leafs Jeff Carter and a first round pick. But that was a once-in-a-lifetime opportunity, because the Flyers were desperate and Carter is a young franchise player and it was a great draft and I'm going to go punch myself in the eyeball right now. Right, Kaberle. Don't panic. Come the deadline, GMs will talk themselves into overlooking his one rough season and will stay pay close to top value for him. If anything, his recent slump may convince GMs that he represents a good value now. That's especially true if he starts to pout over his benching, leading to plenty of "maybe he needs a change of scenery" stories. GMs may jump at a Kaberle deal if they feel he'll come even a little bit cheaper, like a guy who talks himself into an expensive new TV he doesn't need because the salesguy says it's 5% off today only. Toskala, on the other hand, is a career backup who has one solid season as a starter under his belt. If he struggles, his value really does tank. So panic about Toskala. But not Kaberle. Two thoughts on this whole "sloppy seconds" debacle. The NHL was absolutely right to suspend Avery. He has a history of inappropriate behaviour, and his actions have damaged his team and his league. This is not the sort of publicity the NHL needs right now. "Sloppy seconds" is an obscene and offensive term. It has no place in a league like the NHL, or frankly in the discource of grown, mature adults. So... we can all agree we're going to start dropping "sloppy seconds" bombs on whichever team signs Sundin, right? We recently named Kevin Maguire our worst Leaf goon of all-time, based largely on his inexplicable decision to fight Wendel Clark during a practice. What was he thinking? Why would you ever want to fight Clark if he was your teammate? Did Clark hit him so hard that he suffered retroactive brain damage to 30 seconds before? Well, thanks to a wonderful thread over at Rough House Hockey of old Wendel Clark newspaper articles, now we know the background. Rick Matsumoto Toronto Star. Toronto Star. Toronto, Ont. : Sep 16, 1986. The hockey season officially got under way yesterday for Wendel Clark. He got into his first punch-up of the season and, as has come to be expected in National Hockey League circles, he scored a decisive victory. The Toronto Maple Leafs' prize rookie of last season accepted a challenge from another tough, young competitor, Kevin Maguire, and left the right winger, who spent the past two seasons with St. Catharines Saints, with a dandy black eye, a cut on the bridge of his nose and a severely-bruised ego. He also left several ounces of blood on his sweater, as well as that of defenceman Bob McGill, who stepped in to break up the combatants. The two clashed during the afternoon scrimmage at the Gardens. Clark took Maguire, who earned 273 penalty minutes in two seasons with the Saints, into the boards at Maguire's end of the ice. They exchanged shoves and glares as they shadowed each other back to Clark's end of the ice. Suddenly, push turned to shove and the gloves came off. But, as many others found out the hard way last year, Maguire failed to get in the first punch. Clark landed a haymaker flush on Maguire's right eye and, for all intents and purposes, the fight was over. Clark rained several more blows on Maguire's face and helmeted head and the latter swung back gamely, but the judges scored it a TKO for the Kelvington Crusher. "That first one was the hardest punch I've ever been hit with," Maguire admitted later. "That was it. It was no contest after that. By the time I got my balance it was done." Maguire, however, wasn't done. After being patched up, Maguire pulled on a clean jersey, returned to the scrimmage and immediately went after Clark. "You don't let anyone get three or four clean shots at you and not want to even the score," said Maguire. "I was a bit off balance the first time. I'd have liked to have squared off with him, again, toe-to-toe." However, Clark, who was nursing sore knuckles on his right hand, refused to drop his gloves the second time. "I don't need to fight you, again," he could be heard shouting at Maguire as teammates interceded. For the next few shifts the two combatants were prevented from being on the ice at the same time. Eventually, however, they found themselves face-to-face, again. This time, the incident turned slightly ugly as Clark slapped at Maguire's menacingly raised stick with his own and Maguire reacted by jabbing Clark in the chest with his stick. That's when Russ Courtnall jumped into the fray, put a head-lock on Maguire and wrestled him to the ice. "First of all, Wendel had beaten him cleanly the first time, so there was no need to fight again," said Courtnall. "When you see guys with their sticks in the air you get a little scared. We can't afford to lose Clarkie to a stick." Clark, who has shown he can play hockey as well as fight, shrugged off the incident as a natural occurrence in the annual battle to gain a big-league job. The 19-year-old left winger, who scored 34 goals as a rookie, said he's not interested in prolonging the incident. That is, of course, unless Maguire renews hostilities the next time they meet on the ice. "It's up to him," said Clark. "If he feels he has to do that to make the club, that's fine. I don't hold that against him. But if he takes a poke at me he's going to get poked back." Maguire also emphasized that there were no personal feelings involved in the pugilistic exhibition. "There was no intent behind the fight," he said. "It was just the way it happened. I'm not going to try to carve his eyes out or anything. His job is secure. Mine isn't. I've got to make my way onto the team. I've got to do what I can to do that." While the combatants might not harbor deep animosity towards each another - and could possibly even become good friends if Maguire managed to make the Leafs - one thing is certain: They didn't go out to dinner together last night. So on the one hand, now we know that the fight happened in Maguire's first stint with the Leafs, when he was a rookie trying to make a name for himself. That makes it a lot easier to understand. He got taken down to the ice by Russ Courtnall. So I'm going to go ahead and say that Maguire retains his crown as Worst Leaf Goon. Now head over to the Rough House Hockey thread and start reading. Trust me, it's a goldmine for Clark fans. I'm still reeling from finding out that Clark and Joey Kocur weren't really cousins. 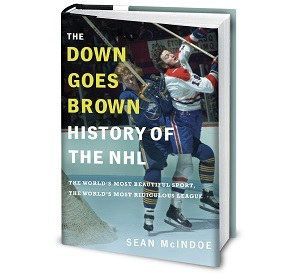 Just a quick note that we're making some changes to switch some URLs over to the downgoesbrown.com address instead of blogspot.com. This could cause some down time over the next 24 hours, depending on where you're located and whether the DNS changes have drifted your way yet. If you try to hit the site and get a "page not found", don't despair. We should be back up and running shortly. In honor of tonight's game, here's an oldie-but-goodie for most of you, and maybe something new for those of you who came aboard last month. So help me, if MLSE tries to give him a retirement ceremony like they gave Dan Marouelli for his 1,500th game, there's a good chance you'll see my picture on the front page of the newspaper the next day. I set two goals for myself going into this season. Two milestones that, if reached, would let me know that my work here wasn't going to waste. The first was to top 10,000 visitors in a month. Due largely to rampant Wendel-mania, that happened in November. Thanks to everyone for your continued support. The second, far more important goal: to have one of my ideas blatantly stolen by an NHL franchise. Ladies and gentlemen, the Vancouver Canucks! Nov 27, 2008, 12:39 PM EST Vancouver, B.C. – The Vancouver Canucks are proud to announce that Canucks.com will celebrate 16 Days of Trevor Linden, beginning on Monday, December 1st, 2008. The special 16-day initiative will take an in-depth look at Trevor Linden's career, concluding on December 16th, 2008 just one day prior to Trevor Linden's sweater retirement ceremony. 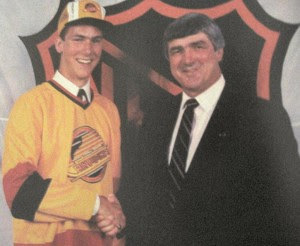 The 16 Days of Trevor Linden will feature video and print content as well as a series of photo galleries highlighting Linden's hockey career spanning more than two decades. The 16 days of coverage encompasses draft day in 1988 through to his last game on April 5, 2008 and will include stories and accounts from on and off the ice courtesy of former teammates, coaches, fans and countless others impacted by Trevor. Exclusive commentary from former teammates and coaches will highlight a collection of excerpts to be included in the 16 Days of Trevor Linden. Video content will depict the terrific '94 run to the Stanley Cup, a collection of Linden's most memorable goals from his 19-year NHL career and a number of other significant moments in Linden's career. A compilation of photos will comprise a series of photo galleries including one gallery highlighting some of his many involvements with those in the community. To access the 16 Days of Trevor Linden, please go to Canucks.com starting December 1st through December 16th, 2008. What a fantastic idea. Why didn't I think of it? You can preview the full list here. It kicks off today with Linden's draft day (cough). Future installments will include Linden's emotional return after being traded away (cough), and the heart-felt ovation he received from the home fans late in his final game (dammit, why can't I stop coughing?). So apparently, this week's trade works out like this: The Leafs get Vancouver's last two GMs, the Canucks get a stolen blog gimmick and a conditional back-stabbing captain to be named later. I'm going to go ahead and call that even.